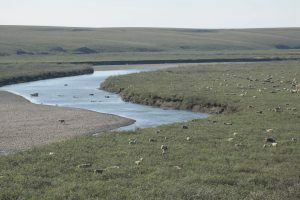 Today Trustee’s attorneys presented oral arguments before the U.S. District Court detailing how the U.S. Bureau of Land Management unlawfully conducted lease sales in the Western Arctic. Trustees took the Trump administration to court in February on behalf of five clients. The law requires that the Bureau of Land Management take a close look at the impact of oil and gas activity in the Western Arctic—also called the National Petroleum Reserve-Alaska—before selling the rights to development. In today’s arguments, Trustees argued that the agency never looked at the site-specific impacts or the cumulative impacts of multiple development proposals before issuing leases. 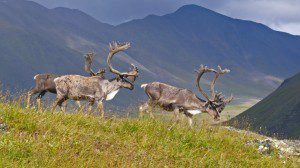 Alaska Native people have relied on multiple caribou herds in the Western Arctic for food and culture for thousands of years. Photo by Bob Childers. We further argued that BLM failed to retain the ability to say “no” to later development proposals, even if those proposals would disrupt animal migration routes and nesting areas, the availability and access to wild foods, and the sustainability and health of wildlife habitat. Worst yet, the administration plans to continue using this unlawful process for future lease sales. Not on our watch. The Western Arctic is the largest unit of public land in the country. It provides wild foods to Alaska Native people, vital nesting and molting sites for hundreds of thousands of birds, and habitat for a wide range of wildlife. Yet what we call the Western Arctic is part of an interconnected Arctic region that spans northern Alaska and Canada, and indeed across the globe. Communities across the Arctic regions have suffered the full brunt of a changing climate. a modification of the Integrated Activity Plan to promote oil and gas development in areas currently protected because of their critical importance to wildlife and people. Going to court is just one way in which Trustees works within broad coalitions to protect the Arctic. Clients: The Northern Alaska Environmental Center, Alaska Wilderness League, Defenders of Wildlife, Sierra Club, and The Wilderness Society.